No one likes to waste time getting their oil changed or doing it themselves- but it’s a necessity to keep your engine performing its best, for long life, and for better fuel economy. But what if you could wait till 12,000 do change your oil? NOW YOU CAN with Royal Purple’s new filter – that’s what impressed me the most. 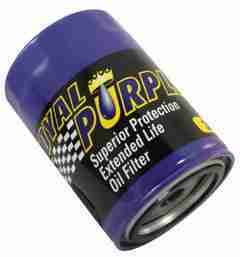 Royal Purple filters are fully compatible with all synthetic and conventional oils. However I recommend PURE synthetic oil only. Follow vehicle manufacturer’s recommended oil change intervals and oil types. All warranties remain in effect when using Royal Purple filters. Filter change intervals may be extended up to 12,000 miles for vehicles no longer under warranty, which are in good mechanical condition and which operate under optimal driving conditions. The newest Royal Purple premium high performance oil filter meets or exceeds the performance of today’s leading filter brands. The price of the filter is around $14. Bring it to your mechanic or do it your self — Now that is worth it.